Who says big-budget videos are a thing of the past? On Friday (Feb. 16), Drake put that notion to rest by unleashing his “God’s Plan” video. At the very beginning of the visual, information flashes on the screen that includes Drake and his team spent nearly $1 million during the shoot. 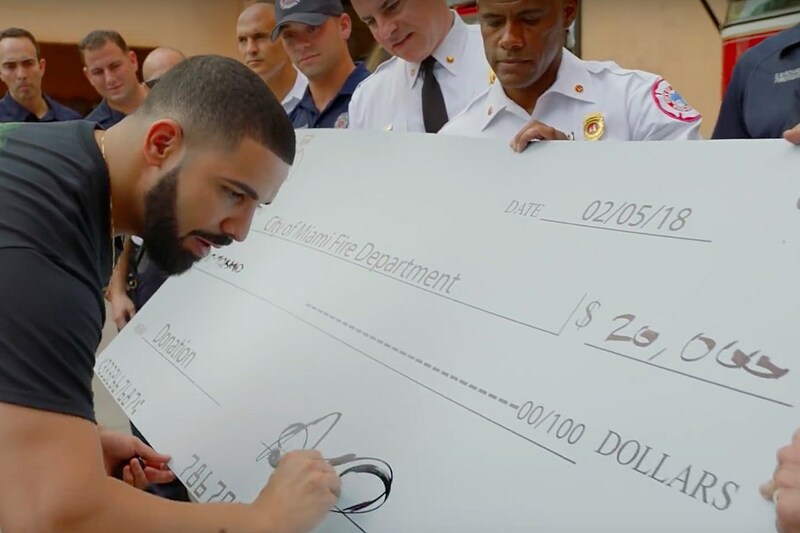 The catch is that Drizzy and company used the money on the people of Miami instead of things like big-name guest appearances and flashy special effects. In the video, which begins with an amount indicating that Drake gave all of the $996,331.90 to folks around Miami, Drizzy travels everywhere from a local high school, to a grocery store to the sidewalk of the famed Florida city. At each stop, he creates a moment Miami locals will never forget. At one point, a 20-year-old University of Miami student by the name of Destiny James is embraced by Drizzy, who gifted her $50,000 to pay for her college tuition. In another part, we see the rapper sitting down with a woman and someone who’s presumably her son as he gives her a fat stack of cash. In a touching moment, she begins to cry just a moment later. In case you didn’t know, these acts were all part of a legendary giving spree Drizzy embarked upon in the first several days of February. We reported that Drizzy donated $175,000 in his first few days of being generous, but it looks like that’s just what was publicly documented. On Feb. 5, Drizzy visited Miami Senior High School, where he donated $25,000 to the school and some custom OVO-sanctioned school uniforms. On Feb. 6, he donated $50,000 to Lotus House, a Miami-based homeless shelter for women and children. That same day, the 6 God stopped by Sabor Tropical Supermarket to buy groceries for everyone that happened to be in the building. He reportedly dropped $50,000 on the shopping spree, and in the video, we see folks happily copping food as they stroll down the aisle.